The Kings Head, Five Lanes, PL15 7RX. Wiltshire, a rural county covering an area of 3,500 sq Km, is full of diversity with superb countryside, market towns, the famous chalk hill carvings of the white horses and plenty of ‘mystical forces’. Wiltshire is also home to the famous World Heritage site of Stonehenge, an ancient stone circle of which the true meaning has been lost in the mists of time. During the summer crop circles appear in the fields in the centre of Wiltshire’s numinous landscape and the county is also full of numerous ‘haunted houses’. Salisbury is a traditional English cathedral city with medieval roots mixed with the vitality of modern life. The city boasts five rivers running through the town – Nadder, Ebble, Wylye, Bourne and Avon and is home to the world’s oldest working clock. Wiltshire Balloon flights meet at the Larmer Tree Gardens near Tollard Royal in South Wiltshire. Due to new ‘no fly’ zones and restricted military areas surrounding Salisbury we can no longer fly from the city. The closest meeting point for passengers coming from the east and South Wiltshire is Larmer Tree Gardens. For people travelling from the North and West, Henstridge Airfield just across the border in Dorset is the closest launch site. The stunning Larmer Tree Gardens, dating back to the 10th century is one of our most beautiful locations to take off from and offer a spectacular starting point from which to float over the beautiful Wiltshire countryside. A balloon flight in South Wiltshire offers stunning views of winding river valleys, ancient woodlands, numerous hamlets and Roman roads. On a clear day you can often see Salisbury Cathedral, which boasts the tallest spire in Britain and Salisbury Plain, a landscape full of rich archaeology and featured in artwork by Constable. You may also see Stonehenge and the West Wiltshire Downs, The New Forest, The Solent and The Isle of Wight. 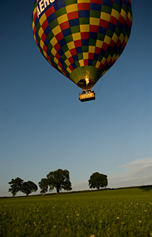 For balloon flights to the east of S.Wiltshire we recommend using Adventure Balloons. Follow the brown Tourist Information signs, off the A30 at Ludwell and off the A354 Salisbury/Blandford road at a staggered junction half a mile South West of Cashmoor. Approaching from Salisbury take the A354 Blandford road for approximately 17 miles (do not turn off to Tollard Royal). Keep on the A354 through Cashmoor, after half a mile at the junction, turn right. *After 900 mtrs turn left, through the tiny village of Newtown. The drive to Larmer Tree is on the right and marked with large green signs. Approaching from the south via Blandford take the A354 Salisbury road for 9 miles. At the top of a hill you will approach a staggered junction, turn left and follow instructions from * above. Approaching from the north via Shaftesbury take the A30 towards Salisbury at the Royal Chase Hotel roundabout. After about 5 miles you will be in Ludwell village, at the signed junction turn right. Follow the road to the top of the hill, at the junction turn left onto the B3081 towards Tollard Royal, take the second road to the right. The entrance to the Larmer Tree will be the second turning to the left after about 2 miles. Our meeting place is outside the big farm buildings on the right, half way up the drive. Do not use sat nav for your final approach as this will lead you up a long muddy track with no exit.